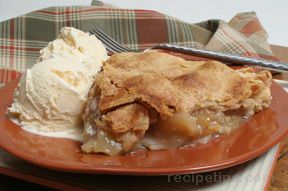 Who can resist this tempting Deep Dish Apple Pie Recipe stacked high with sweet and cinnamon apples? Serve it warm or cold, with ice cream or without, or topped with whipped cream, whichever way you serve this classic apple pie recipe, it's always a special treat. Peel, core and thinly slice apples. Place in a large bowl. Drizzle lemon juice over apples and toss to coat. In a small bowl, combine sugar, flour, cinnamon, nutmeg and lemon zest. Stir until combined and pour over sliced apples. Stir to coat. Roll out crust to fit, just over the edges of pie plate. Place apple mixture on crust. Press apples firmly into crust. Cut butter into 4 pieces and place on top of apples. Roll out second crust so it will cover apples. Crimp the two crusts together. Cut about 4 slits in top of crust. Place foil around outside edges of crust to prevent over-browning. Sprinkle top of crust lightly with cinnamon and sugar if desired.